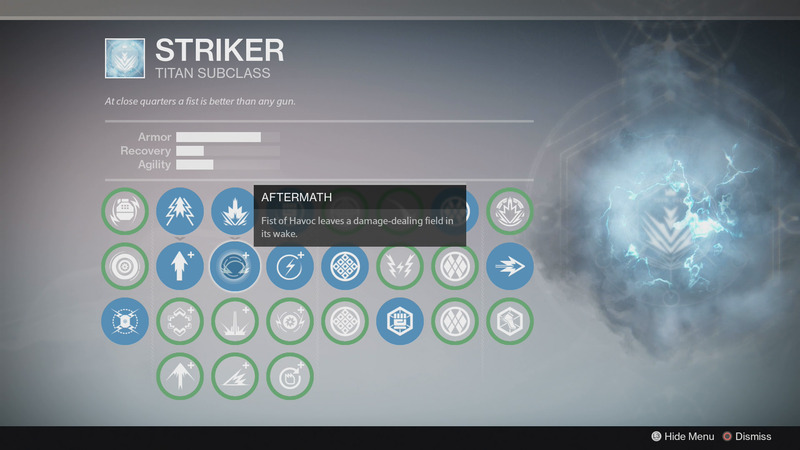 The best Titan Subclass in Destiny is the Striker, and here’s why. Destiny’s theme has always been about becoming a legend, and if there’s one thing that all Titan’s know, it’s that playing as a Striker will make you feel like a legend. Whether you want to throw punches in the Crucible or punch your way through the Wrath of the Machine Raid, the Striker is the best Titan subclass in Destiny. 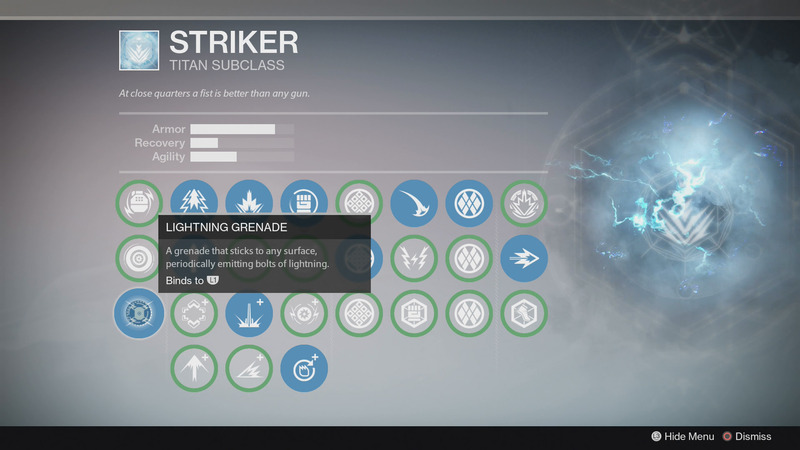 The Striker Titan has two of the strongest grenades in the game with two very different purposes, the Lightning Grenade and the Flashbang Grenade. Being able to switch between and effectively use these two grenades makes the Striker one of the deadliest classes in Crucible. In Destiny you need to be able to oppress and harass your opponent, and the Lightning Grenade is ideal for this as it combines high damage with area-of-denial. While it shares similarities with the Tripmine Grenade, it doesn’t require waiting for an enemy to proc its sensor, meaning it begins dealing damage as soon as it lands. One disadvantage it does share with the Tripmine Grenade, however, is that it can be shot off of the wall. This can be part of a counter play by using the Lightning Grenade as misdirection, attacking an enemy while their focus has shifted. If you prefer a higher level of utility, the Flashbang Grenade is ideal. The Flashbang Grenade is one of the few items in the game that can completely blind an opponent. In Crucible and PvE, a well-thrown Flashbang Grenade can give you the precious seconds needed to reposition yourself to better attack, or flee from, an enemy. Despite the Titan’s short arms, their fists pack quite the punch and there’s no better proof of this than the Striker’s Storm Fist. Storm Fist already does high base damage, but when coupled with any one of the modifiers the usefulness of the humble punch increases. Apply Overload and your punches have a chance to reset Storm Fist’s cooldown. Or Amplify, where Storm Fist kills significantly reduces your Super cooldown. The benefits of Amplify are apparent in Crucible and PvE play where having your Super available can mean a win. 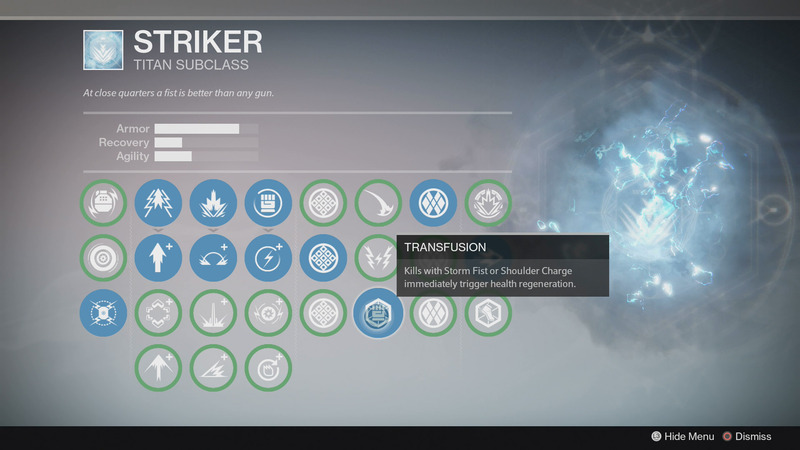 There are only 2 perks that a Striker Titan wants to know about in the current Destiny meta, and they are Shoulder Charge and Transfusion. Shoulder Charge is not only a one-hit kill, it also makes you extremely fast. Opponents won’t know how to react when you close the gap with Shoulder Charge and kill them with a Shotgun. Transfusion makes kills with Storm Fist or Shoulder Charge immediately begin health regeneration. Chances are you’ve been in a situation where a Shoulder Charge, despite earning you a kill, has left you in a vulnerable position. Transfusion will help you if you overextend trying to earn that kill. Your health will regenerate, affording you more time to kill the other enemies or retreat. Fist of Havoc makes Hunters cry and Warlocks scream in anger. 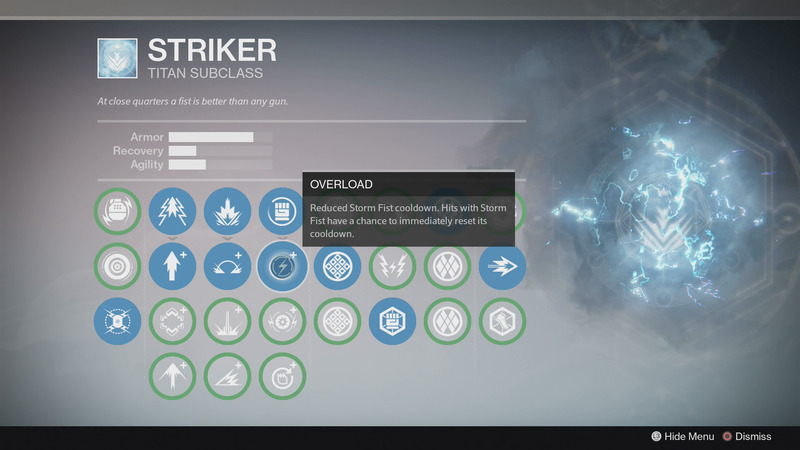 The Striker’s Fist of Havoc is the ultimate counter to other Supers with its incredible damage output and damage resistance during cast, even allowing you to potentially live through a Golden Gun shot. The Fist of Havoc is perfect for PvE wave clearing or Crucible Control Point clearing. Though, in Crucible, one of the best moments is shutting down an enemy Super in Trials of Osiris and scoring the victory. The Fist of Havoc has some interesting modifiers with two that are the most useful, Aftermath and Shockwave. Aftermath leaves an area of the ground pulsing with electricity while Shockwave sends a ripple of Arc energy in a straight line. Aftermath is excellent at denying the enemy a stronghold or preventing them from reviving a teammate while Shockwave, with its incredible range, can take your enemies by surprise. In Destiny there’s nothing quite like raw power, and the Striker has this in spades. Whether you want to be the fastest Class out there, or just want to throw high-damage punches, the Striker Titan has you covered. From humble beginnings in Year 1 of Destiny, the mighty Striker has risen from the ashes to knee everyone in the face.